A meeting is a gathering or assembly of related members of an organization with specific objectives. It is the act of getting together in response to a pre- notice on a certain date, place and time to discuss and decide on specified matters or agenda. It is the formal process of involving concerned members of the organization in the decision-making process. It is the democratic way of presenting, discussing and solving problems. It refers to the formal practice of presenting proposal, sharing opinions on the proposal between and among the members and passing it with the consent of a majority. A meeting is, therefore, an assembly of concerned persons for sharing information, presenting proposals, making suggestions, taking decisions and obtaining feedback. Meeting is important for informing the concerned members about the present situation and condition of the office. It is important for legalizing the decisions and their records. It is important for getting immediate reactions to new ideas, rules, proposals and plans. It is important for controlling the staff and activities of the organization. It is important for making an effective execution of the plans, policies, and decisions. It is important for making decisions reliable and productive. Secret meeting: Secret meeting is by nature secret. Only a few concerned would know about this type of meeting. In such meeting, concerned executives discuss a very important matter. Such meeting is always meaningful. In the governmental sector, such meetings are held in the involvement of high- ranking officials and departmental heads. As the meetings are held secretly, it is obvious that the decisions of such meeting are not made public. This type of meeting is very much effective to formulate secret plans and policies at the higher level of governmental bodies. Secret meetings are also held by people of private organizations for various purposes. Board meeting: Board members are the governing body of any company. Such board member is nominated or elected by the shareholders. They have to meet time for various reasons and purposes. A meeting of all the board members is called the board meeting In this meeting, the board of directors meet regularly and discuss the internal management of the company. They focus on present activities of the company. They determine the company's plans, policies and programs for the smooth running of its business even more efficiently in the days to come. The duration of the two board meetings should not be more than three months. The rule of the majority applies in making a final decision. This type of meeting is held to discuss the current problems and issues, formulate future plans and policies and make the management and administration efficient. Committee meeting: A committee is a body of a small number of concerned people in private offices. It is formed for performing a given job or investing and reporting a certain event or happening. Evaluation committee, examination committee, inspection committee, account committee and loan committee, etc. are the examples of the committee formed by different offices. The members of the committee frequently get together and discuss the performance, progress, achievement, and finding. Such gathering of the member of committee is known as a committee meeting. Uni- lateral and Multi- lateral meeting: A uni- lateral meeting is the one in which only the members of a particular organization get together to discuss the specific issues and take decisions. A multi- lateral meeting is one in which the members of more than two organizations get together to discuss the matters of common issues and take decisions. It is organized to make decisions on such matters which affect the interest of all the organizations. Multi- lateral meeting is held among the members of more than two political parties or executives of more than two countries. Multi- lateral meeting is very important to settle the misunderstanding among different organizations and countries. The meeting which is held between two organizations or countries is called a bi- lateral meeting. A meeting is a gathering or assembly of related members of an organization with specific objectives. 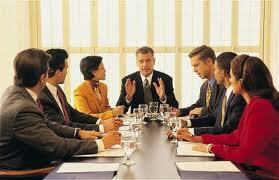 There are four types of meeting secret meeting, board meeting, committee meeting, Uni- lateral and Multi- lateral meeting. Write down the importance of meeting. It is important for making effective execution of the plans, policies and decisions. Write in short about board meeting. Board members are the governing body of any company. Such board member is nominated or elected by the shareholders. They have to meet time for various reasons and purposes. A meeting of all the board members is called board meeting. In this meeting, the board of directors meet regularly and discuss the internal management of the company. They focus on present activities of the company. They determine the company's plans, policies and programs for the smooth running of its business even more efficiently in the days to come. The duration of the two board meetings should not be more than three months. The rule of the majority applies in making a final decision. This type of meeting is held to discuss the current problems and issues, formulate future plans and policies and make the management and administration efficient. Write in short about secret meeting. Secret meeting is by nature secret. Only a few concerned would know about this type of meeting. In such meeting, concerned executives discuss about very important matter. Such meeting is always meaningful. In the governmental sector, such meetings are held in the involvement of high- ranking officials and departmental heads. As the meetings are held secretly, it is obvious that the decisions of such meeting are not made public. This type of meeting is very much effective to formulate secret plans and policies at the higher level of governmental bodies. Secret meetings are also held by people of private organizations for various purposes. Write in short about committee meeting. A committee is a body of a small number of concerned people in private offices. It is formed for performing a given job or investing and reporting a certain event or happening. Evaluation committee, examination committee, inspection committee, account committee and loan committee, etc. are the examples of the committee formed by different offices. The members of the committee frequently get together and discuss the performance, progress, achievement and finding. Such gathering of the member of committee is known as committee meeting. Write in short about uni-lateral and multi-lateral meeting. A uni- lateral meeting is the one in which only the members of a particular organization get together to discuss on the specific issues and take decisions. A multi- lateral meeting is one in which the members of more than two organizations get together to discuss on the matters of common issues and take decisions. It is organized to make decisions on such matters which affect the interest of all the organizations. Multi- lateral meeting is held among the members of more than two political parties or executives of more than two countries. Multi- lateral meeting is very important to settle the misunderstanding among different organizations and countries. The meeting is held between two organizations or countries is called bi- lateral meeting. A meeting is a gathering or assembly of related members of an organization with specific objectives. It is the act of getting together in response to a pre- notice on a certain date, place and time to discuss and decide on specified matters or agenda. It is the formal process of involving concerned members of the organization in the decision-making process. It is the democratic way of presenting, discussing and solving problems. It refers to the formal practice of presenting proposal, sharing opinions on the proposal between and among the members the members and passing it with the consent of a majority. According to M. C. Kuchhal, "A meeting is a formal gathering of related members of an organization to review its activities, performance, position and to pass resolutions." From the above definition, it is clear that a meeting is an assembly of concerned persons for sharing information, presenting proposals, making suggestions, taking decisions and obtaining feedback. A meeting is a ______ of related members of an organization with specific objectives. "A meeting is a formal gathering of related members of an organization to review its activities, performance, position and to pass resolutions." Who gave this definition? Which one of them is the importance of meeting? Which one of them is the example of committee meeting? ______ is the one in which only the members of a particular organization get together to discuss on the specific issues and take decisions. ______ is one in which the members of more than two organizations get together to discuss on the matters of common issues and take decisions. The meeting which is held between two organizations or countries is called ______. Which meeting is held only once during the life time of the company? Any Questions on 'Meeting '?